I have held AMGEN, the pharmaceutical company, symbol AMGN, since 2017. I am getting a bit nervous about this dividend growth stock. When I get nervous, but the stock is still doing well, I sell calls that are close to the current price but fetch a big premium. 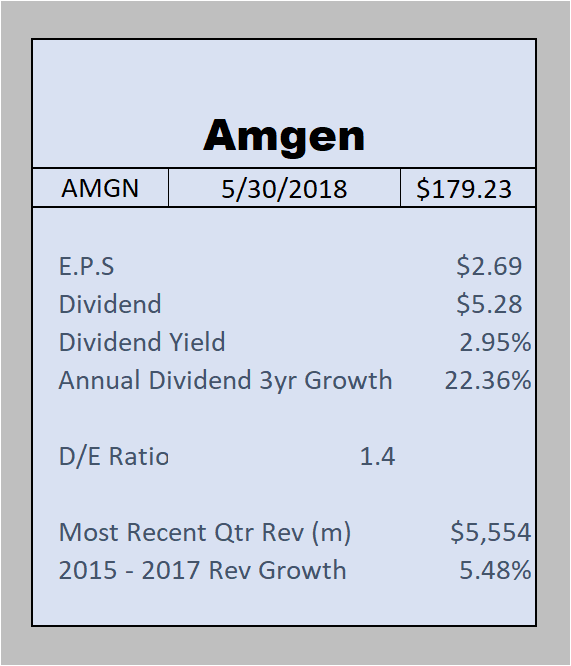 Let's first look at AMGN's dividend growth stock fundamentals beginning with the dividend. Amgen's most recent quarterly dividend (ex-dividend date was May 16, 2018) was $1.32. On an annual basis that is $5.28 per share. AMGN is trading at $179.23 as I write bringing the yield to 2.945%. You could not ask for a more robust dividend growth history. Just over the past 3 years, AMGN has increased the dividend from $.79 in 2015 to $1.32 in 2018. That is an average annual increase of 22.36%. Very impressive. A dividend growth investor has to like this story. While the dividend yield is competitive with the 10 year U.S. Treasury, the dividend growth is compelling. Next let's look at the other fundamental criteria I use to evaluate my dividend stocks. This includes earnings per share (EPS) which I always require to be greater than dividend paid out. Other criteria are revenue growth and debt to equity (D/E) ratio. See the table below which presents all the criteria I use. The issues I have with AMGN are poor revenue growth and high D/E ratio and EPS. EPS are a little out of wack. AMGN took a one time charge that reduced earnings well below the dividend paid out. However, this is not a permanent situation. Their most recent quarter shows they are back to making more in earnings than they pay out in dividends. I am much less concerned about D/E ratio because a biotech has to spend a lot of money to create a new drug and get it to market. However, since 2015 revenue growth has been anemic. When revenue growth is anemic the cash needed to fund those big dividend increases can be inadequate. We income investors are always being warned to not chase yield. Certainly 2.945% is not a great yield and we could not be accused of chasing yield but the we could be accused of chasing dividend growth. Without revenue growth, dividend growth is in jeopardy. 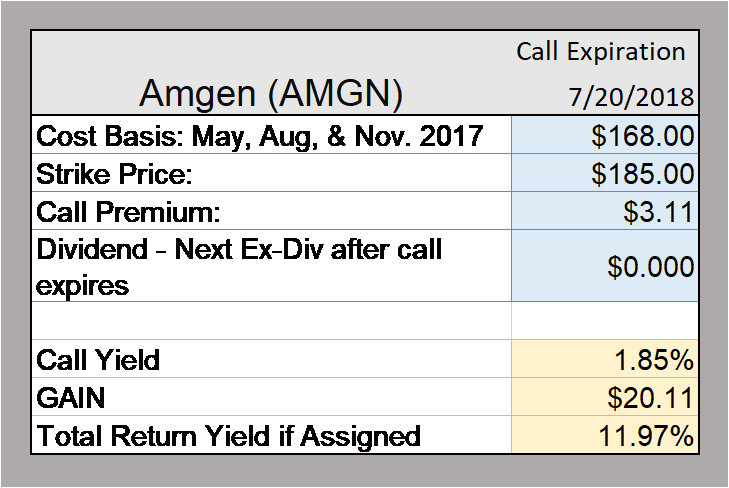 I am selling calls on my AMGN and here is the call I sold today. I was able to find a strike price that is about 10% above my basis. The sweet spot was an expiration date of July 20, 2018 just 51 days away and the premium of $3.11 was hard to turn down. 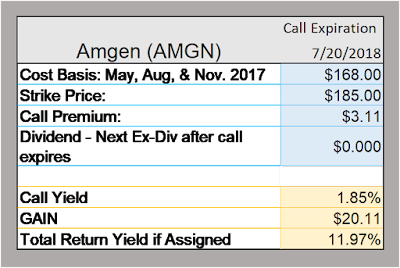 If I get stuck with AMGN after the call expires, I am hoping I can either sell more calls, which reduces my cost basis or I can sell the stock at a profit after the next ex-dividend date. This is how I work my portfolio.